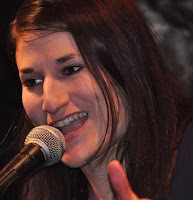 StageBuzz.com: Interview with Joanna Hoffman of "Off the Record"
Joanna Hoffman is a spoken word poet originally from Silver Spring, MD and now living in Brooklyn. In 2006, she was on the DC/Baltimore National Poetry Slam team which performed on Finals stage and ranked 4th in the nation. In 2007, she was the DC/Baltimore Grand Slam Champion and the Individual World Poetry Slam representative for Baltimore. Since relocating to New York for grad school, she has joined the Spoken World Almanac Project and featured at the Nuyorican Poets Cafe. Most recently, she represented NYC Urbana at the 2011 Women of the World Poetry Slam, National Poetry Slam and Individual World Poetry Slam, placing in the top 10 out of over 70 at each competition. She has been published in Spindle and as part of the recent GirlChild Press anthology, Women's Work, and the Jewish lesbian poetry anthology, Milk and Honey. When not performing poetry, she works at a non-profit organization and runs in Prospect Park. Tell me a little bit about Off the Record. Off the Record is about identity, broadly speaking, but it's also about recognizing how conscious choices determine the stories we do or don't hear. Technology has allowed us to literally choose our own news - we can read about what we personally care about, or agree with, and leave the rest. This happens in personal interactions also - we often hear what we want to hear, and ignore the rest. This play is about what happens when we seek out the stories we've been silencing, tell the stories we've been terrified to speak aloud, and let what happens next surprise us. I'm always interested in shows that are written by an ensemble. How did the play evolve? The four writers of this play all knew each other pretty well before this project, though I don't think any of us had ever written together before. Some segments of the piece were monologues, which we wrote alone, but the majority was a group effort. I'm pretty sure I can speak for the four of us in saying that much of our work is normally written in solitude. So, I really enjoyed observing someone else's creative process and actively participating in that. The play's evolution involved a lot of discussion around the issues we wanted to tap into- oppression, privilege, shame, familial pressure. From there, we worked as a group to develop consistent characters, tone and storyline so that we could create a dynamic, engaging piece of theater. Tell me a little about the other people involved in the show. I'm incredibly lucky and excited to be working with three amazing writers, all of whom I met through the spoken word scene. I've known Akua Doku the longest, and I've always wanted to work with her. Her writing and performance style packs a mean punch- she's engaging and fearless. I met both Caroline Rothstein and Camonghne Felix this past year, which is crazy to think about, since I now can't imagine my world without them in it. Caroline never ceases to inspire me- as an body-empowerment advocate, writer and friend. Camonghne has one of the most powerful, heartbreaking, unique young voices to come out of this city. Also, we're lucky to be working with a great director, Alex Mallory, who has been our guide throughout this process. 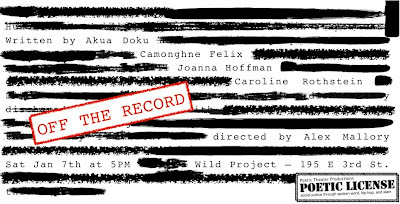 Who would be your dream audience for Off the Record? That's hard to answer. I both want to perform for an audience that will be open to and interested in what we have to say, and also for the audience that doesn't really care or is ambivalent at the beginning of the show, but by the end is won over. If you could say anything to your audience, what would it be? All art is a dialogue, and what makes art meaningful to create is the hope that someone will respond to it. We couldn't do this without you, so thank you!